Equality Florida Greater Orlando and the Central Florida community paid tribute to those whose compassion, courage and leadership united the region in the aftermath of the tragic Pulse Orlando nightclub shooting on June 12, when a gunman killed 49 people and injured 68 others. 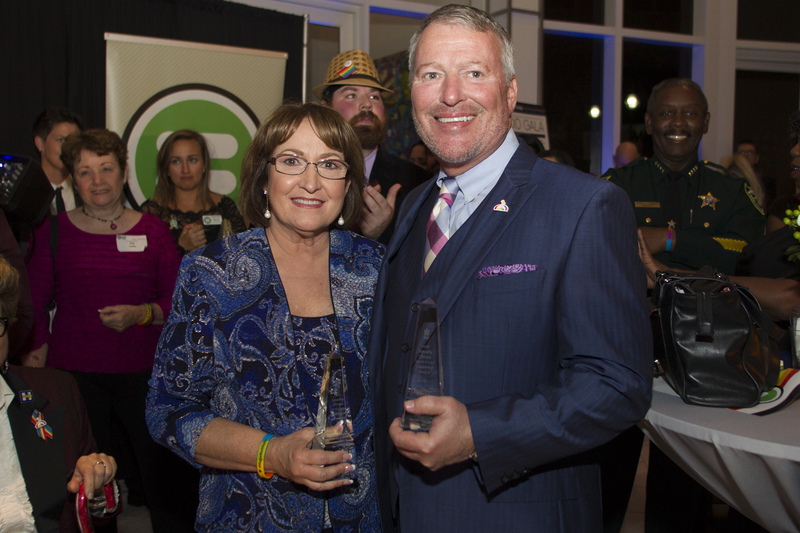 Orange County Mayor Teresa Jacobs and Orlando Mayor Buddy Dyer were recognized with the Service and Leadership Award at the 9th Annual Equality Florida Greater Orlando Gala held on Nov. 4 at the Orlando Museum of Art. The theme of the gala was Honor Them with Action. During the gala, Equality Florida also recognized City of Orlando District 4 Commissioner Patty Sheehan and several organizations, including the Hispanic Chamber of Commerce of Metro Orlando, MBA Orlando, Proyecto Somos Orlando, The GLBT Center of Central Florida, Two Spirit Health Services, Inc., Pulse of Orlando, Zebra Coalition and Orlando Health. The shooting is considered the deadliest mass shooting by a single gunman and the deadliest incident of violence against the LGBTQ community in modern U.S. history. The Pulse tragedy is also considered the deadliest terrorist attack in the United States since the September 11 attacks in 2001. Mayor Jacobs and Mayor Dyer accepted the Service and Leadership Award on behalf of the greater Orlando community. Equality Florida emphasized the importance of unifying the community in strength, inclusiveness and love after the Pulse tragedy. From an elementary school student who planned a bake sale to benefit victims, to the medical and mental health professionals who rushed to the scene and continue to help in the healing process, to the small business owners across the city who donated food and other goods, to the elected leaders who stood united in their response, the Central Florida community truly came together to help the Pulse victims, their families, friends and the community respond and heal. Actor Wilson Cruz, known for his role as Rickie Vasquez on My So-Called Life and Angel in the Broadway production of Rent, was the gala emcee. A relative of Cruz’s was among one of the 49 victims of the Pulse tragedy. In tribute to his loved one and all who were affected by the tragedy, Cruz joined dozens of other Broadway performers to participate in “From Broadway With Love: A Benefit Concert For Orlando,” which took place on July 25 at the Dr. Phillips Center for the Performing Arts. Equality Florida’s CEO, Nadine Smith, also delivered the organization’s State of the State address, which reflected upon the past year and outlined future goals of the organization. All proceeds from the Greater Orlando Gala will be used to further that goal. Equality Florida is the largest civil rights organization dedicated to securing full equality for Florida’s lesbian, gay, bisexual and transgender community. Through education, grassroots organizing, coalition building and lobbying, Equality Florida works to ensure that no one suffers harassment or discrimination on the basis of their sexual orientation or gender identity. To view photos from the 2016 Equality Florida Greater Orlando Gala, visit Mayor Jacobs’ Flickr album.